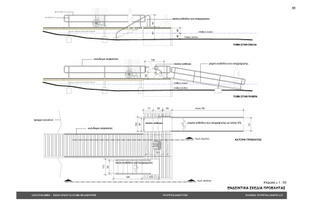 The problem of access 2 the sea if U are disabled - proposals. current job, project manager at the Greek Ministry of Health and Social Solidarity. 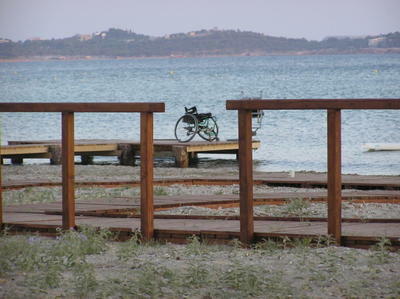 In this presentation, there is an analysis of the user’s point of view of a wheelchair user, on the issue of accessibility to the natural environment and especially to the beach but also a description on a program launched on this issue by the Greek Ministry of Development from 2003 to 2004. Guidelines and two pilot projects came as a result out of that program. The prescription of the problem. As long as I can remember myself I used to go swimming with the help of others. During my childhood it was and partly still is very popular to go for swimming taking hired buses to the shores of Attika. Mothers and children used to do that and nowadays elderly people are the customers of this product. Of course when somebody grows older one can not be helped with the same convenience as when one, was a child. When I became an adult I realized that if I wanted to have a personal choice and if I wanted just to live like anybody else I had almost no choice at all. It is so easy for everybody to go for swimming and so difficult for a person who is disabled and a wheelchair user to do just that. As my observation of swimmers and beach facilities was progressively getting more specialized, I realized that elderly people have almost similar needs to those of disabled. They find it very annoying to walk on the pebbles or on hot sand and they anxiously search for something to hold on to as they try to enter and get out of the sea. In additionally to all that, mostly of the elderly go swimming after they have been instructed to do so by their physician or physiotherapist in order to maintain or improve their health condition. · The uniqueness’ of swimming. Swimming is a very unique experience for a disabled person and especially for a mobility disabled or a visually impaired person. Gravity – God’s gift to everyone – remains your worst enemy which keeps you limited and obligating you to make a great effort for the simplest things. How can the impact of gravity be reduced? How can it be to feel one with the nature, without any artificial interference such as technical aids and attachments to your body? How can you feel, liberated and move your body as you wish without extra unnatural effort? The only place and the only method that I know is TO BE IN THE SEA. Furthermore, the lifting power of the water and the elements of the sea are therapeutic to all the systems of the human body. Another thing that you think of, if you move and live at the level of a wheelchair, is that in the sea, you are able to see everyone’s face right in front of you and not above you! Choosing a tourist destination is so strongly connected with everyone’s freedom and ability to choose and to be well informed. Of course when you live under the conditions of disability you have to be able to use the infrastructures and services of the place you are going to spend your holidays. In Southern Europe and I presume in everywhere else in the world, a destination has a lot of extra value when there is a beach nearby. Sun-bathing, swimming are synonymous with holiday leisure and activity. Fun, relaxation, joy and happiness are things that we expect when we are on holidays. Disabled people can not take that for granted when they try to have their holidays. They have to spend a lot of their time in planning their holidays and of course they have fewer opportunities in having a choice, because there are NOT a lot of places that they have the proper infrastructure and services. As for the beaches there is a feeling that a ramp or a corridor that allows a wheelchair user to get close to the sea makes the whole approach accessible but to my knowledge and according to the aspirations I have for my living standards, this not enough at all. A ramp or a corridor surely is a steady base and you are able to roll and be rolled instead of trying to move yourself on sand or pebbles, if that of course is possible. Entering the sea is something that has to do with dignity and safety and to fulfill these certain work has to be done and a new aspect has to be adopted. There is this principle that you allow everybody to handle his body the way he wishes and to be helped only if his asks for help. If you have this principle in mind you can understand that there is a problem for paraplegic and quadriplegic and also for disabled people who partially walk, in entering the sea. How are we supposed to handle this route from the wheelchair to the sea? Is somebody expected to crawl or to be dragged? A wheelchair user or somebody who has some kind of kinetic disability can not move or roll himself on a beach, sand, pebbles and rocks are the usual obstacles that faces and getting there sometimes is already a success. As anything else involved in the movement of a disabled person I have to make again a reference to the “chain of accessibility”. By that, with few words, we mean that every part of the transportation from the beginning to the end has to be accessible, from home to job, from office to hotel, from bus station to hospital, from the park place to the super market, in our case from home or hotel room to the beach. Every chain is consists of rings. On the rings of the accessibility chain that refer to home environment, the city environment and generally to the built environment there is rich bibliography and countless examples. But when somebody wants to face the issue of accessibility in the natural environment and, as it is in our case, the access to the beach, there is almost no bibliography and as far as I have been lucky or unlucky in my research there are very, very few examples of accessible beaches or similar infrastructures. 1. First and essentially, information: finding out what to expect. 2. Arrival - Transportation. The disabled swimmer has to find a way to get to the beach. This can be achieved either by public or private transport. 3. Rolling or walking on an unstable surface. 5. Getting in the sea. 7. Getting out of the sea. 9. Departure from the beach – transportation. Of all the factors above there has been quite a lot of experience with 2 and 3 but apart from these, there is very little experience or information. Preparation and entering the sea, and what comes after this, is very poorly understood. This is a very crucial point and here is where our recent work in Greece has made a major contribution by, suggesting a particular innovation. Before we analyze it we should analyze the use of assistive technology and technical aids to the life of a disabled. Wheelchairs, canes, sticks, headsets, adapted cars and, furthermore GPS navigators and specially designed PC units, allow a disabled person to live, work and move in his daily life or going from one place to another within the limits of his hometown and country but also from country to country. Assistive technology and technical aids are part of the answer to each one’s need. There are products that cover various needs for a quite wide spectrum of disabilities, access to the sea in not an exception at all, wheelchairs that can enter the salty sea water without being corroded, wheelchairs that can easily be rolled on the sand can be provided to everyone that’s is going to use it, of course if the user can afford to buy it and if there are enough human resources to provide the proper administration of all those items. Anyhow the principle of equal opportunities and equality to all citizens clearly gives us the basis, to stand for a demand that at least a disabled swimmer has the right to use an infrastructure that gives him the opportunity to enter and get of the sea on his own, and I think that is the greatest demand of us all disabled swimmers and citizens, to be able to live independently. Year by year there has been progressively a questioning on how to solve the problem and also a social demand was arising year by year. 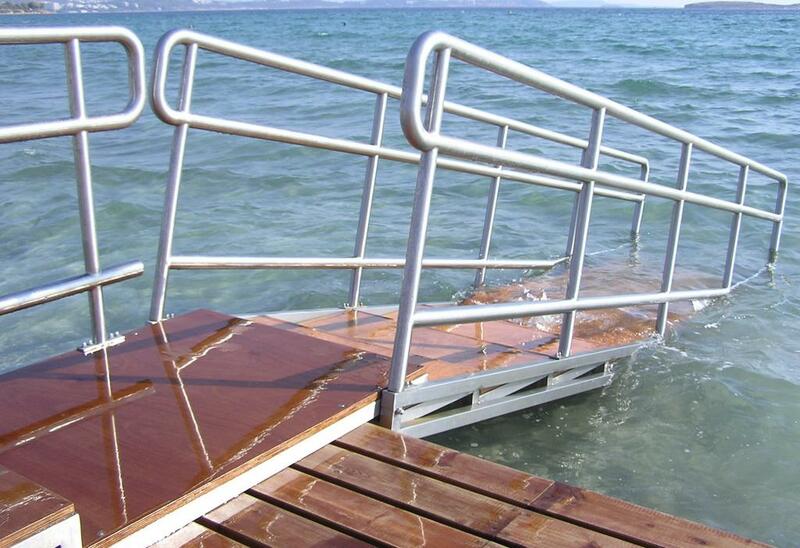 People from Greek municipalities and organizations of disabled citizens had been asking about, how to guide architects and engineers when making a proper entrance for disabled swimmers to the sea. First attempts to solve it. Several attempts to propose a solution had been made at the past. 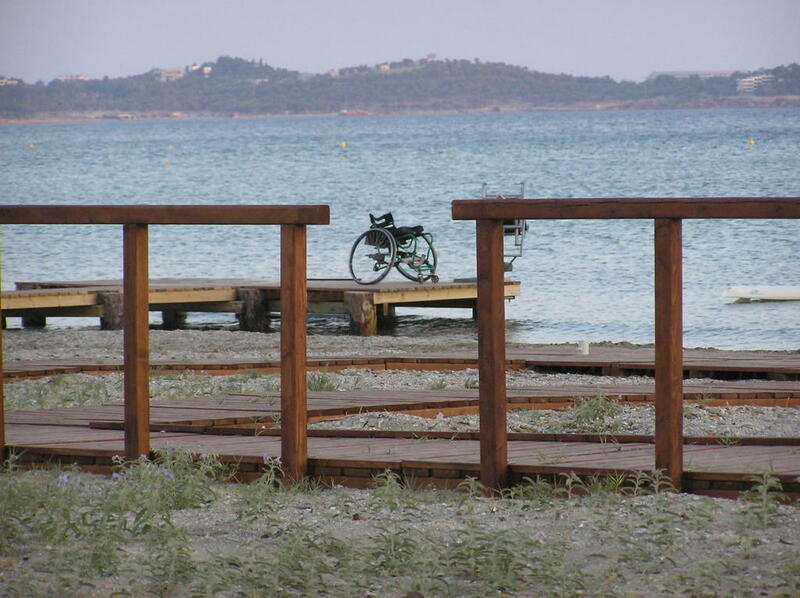 A circular by the Greek National Tourist Organization was made so that accessibility should be obligatory at the use of any beach. It should be very interesting to investigate what happened to this circular and why the whole thing has not been as priority. As an architect I have to say that special guidelines and technical information would allow things to have a better ending. The guidelines - two pilot beaches. In the summer of 2003 the Greek Ministry of Development (part of which later became the Ministry of Tourism Development) launched a programme to renovate the beaches all over Greece. This program was called “Jewelries on sand”. Under that programme another programme launched, focussing on accessibility to beaches for disabled and elderly people, this programme was called “Access for all to the sand”. 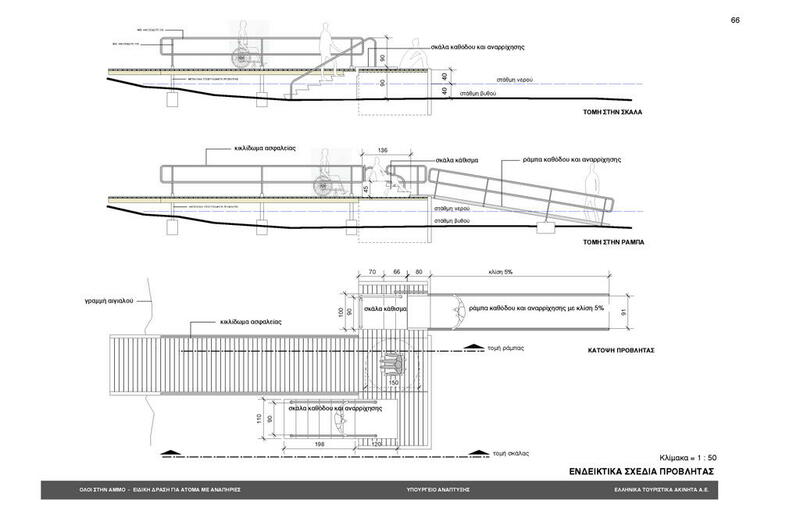 Special guidelines were made with my participation at the supervision of the whole project. · The lack of social cover. Please allow me to make some remarks as to when a structure is needed to be done for the purpose of providing accessibility to disabled citizens or social groups. To my bitter experience this is exactly the case when society really finds out that here there is a case of waste of money, of doubtful decision, of environmental interference to the natural surrounding etc. 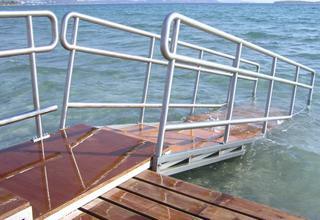 Furthermore, when we refer to accessibility to the sea we have a lot of legal issues as well. People who are, “decision makers”, public officers, mechanics have either subconsciously or consciously in mind that, all this necessity is not a real priority; that disabled citizens are over-reacting once more and that things can be in the way they used to be all those years. In response to all that, I am asking a very simple question; Why is it that we meet such resistance when we are talking about providing quality of life to disabled people and the elderly? Is it more logical to pollute the atmosphere by having, motorcar races? And I wonder if all this scepticism has, been ever arisen when thinking about creating docks and harbors. This is why I feel thankful to the leadership of the Ministry of that time, when they did supported the program. As I have already mentioned before there is this background philosophy behind these guidelines and that can be summarized with the phrase “A disabled swimmer should be able to go swimming whenever he wants in whichever way he prefers using all his potentials and if possible on his OWN”. I do insist on that principle. When we refer to the planning actions in Organizations or other public services, Ministries etc there is always the fear of underestimating the needs that a person with disability has. A disabled swimmer has no less need of choosing the place and the time and the way he can go swimming. This is why by these guidelines we propose the construction or the supply and installation of permanent facilities. Those facilities for example can be wooden boardwalks, accessible and properly designed toilets and bathhouses and special ramps and seating that allow the disabled swimmers to enter ON HIS OWN. It was decided that in the Program “Access to all to the beach”, primarily two actions were going to be done one was a study about accessibility that would come up with some guidelines and secondly two pilot infrastructures to be made so that athletes that would participate in the Paralympics of 2004 could benefit from that. Both goals were succeeded with a delay as to be ready for the Paralympics 100% for the two pilot beaches. These beaches are the Agia Triada beach nearby the second greek urban complex of the city of Thessaloniki and the other one at the municipality of Voula at the first greek urban complex of the capital city of Athens. This one at Voula is within the area of a formal rehabilitation center for children that is a small peninsula. From this second year of operation the PIKPAPLAZ at Voula we have the most encouraging results that we could ever expect. Swimmers that have disability or their companions and members of their family comment about the kind of service they get and the facilities that they are able to use with these words: “We thank you”, “I did not had anywhere to go for a swim”, “Here it’s my FIRST time that I swim in the sea”, “It is so nice, the whole area does not recall to me any misery and ugliness”. What is to be done more? Personally I have committed myself to do my best to inform people and government and local authorities on this issue. Anyone who really understands the necessity of providing accessibility to disabled citizens to the beach can contribute, simply by asking and helping in what is to be done. There is no other way. Asking, demanding and contributing. The good thing is that in Greece now, there is a legacy (a legacy not the solution) to the problem, and it is out there for everyone to get it and improve it, and to network together.